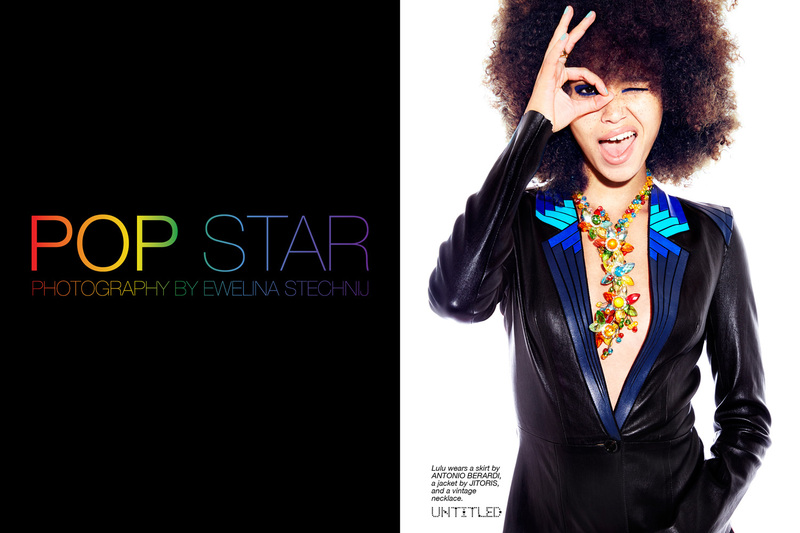 “Pop Star” Photography by Ewelina Stechnij for The Untitled Magazine. Lulu wears a skirt by ANTONIO BERARDI, a jacket by JITROIS, and a vintage necklace. Left Page: Lulu wears a shirt by DSQUARED2, shorts by MISSONI, a necklace by PEBBLE LONDON, a double ring by JULIA BURNESS, stone rings by SVP, and wedges by FYODOR GOLAN. Right Page: Lulu wears a dress by AMANDA WAKELY, high waisted shorts by MARC JACOBS, a scarf by FREY WILLE, bracelets by PEBBLE LONDON, and shoes by CHIARA FERRAGNI. Left Page: Lulu wears a dress by RICHARDS RADCLIFFE, a vintage scarf by HERMES, a clutch by ELENA GHISELLINI, and shoes by CHIARA FERRAGNI. Right Page: Lulu wears a top by FYODOR GOLAN, trousers by ACNE, and jewelry by SOUKSY LONDON. Left Page: Lulu wears a dress by MARC JACOBS, a skirt by ANTONIO BERARDI, a clutch by ELENA GHISELLINI, vintage earrings by CHANEL, her own rings, and wedges by CHIARA FERRAGNI. Right Page: Lulu wears a crop top by ILLUSTRATED PEOPLE, shorts by HOLDA, a jacket by RICHARDS RADCLIFFE, a skirt by FYODOR GOLAN, a necklace by SOUSKY LONDON, a double ring by JULIA BURNESS, and a bespoke VVROULEAUX plaited, ribbon wrist band.